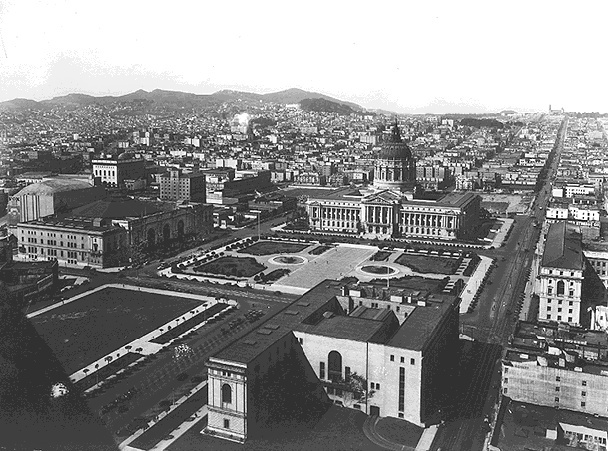 New City Hall, shown here around 1930, with the Civic Auditorium at left and Main Library lower right. 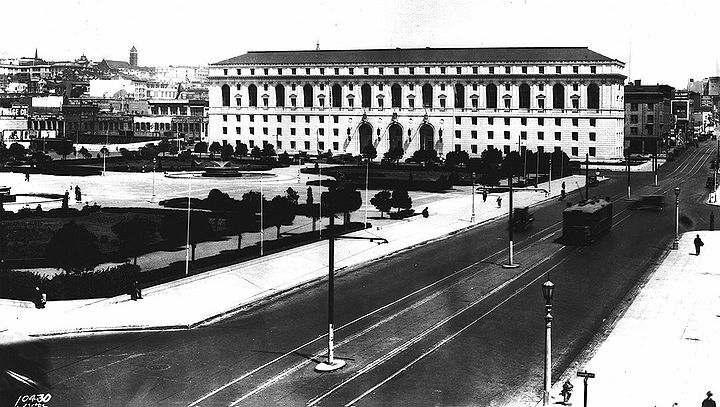 State Building on Grove at Larkin, July 8, 1926, a key element of the redesigned Civic Center built after the destruction of the original City Hall in 1906. Rolph had promised a first-class exposition, and the PPIE had certainly fulfilled that promise, although Rolph could hardly claim he had been responsible. He had promised a new city hall and had delivered in a most convincing fashion. Before the end of his first term, he had dedicated both the auditorium and the city hall and had broken ground for the library. 14. Draper, "San Francisco Civic Center;” pp. 62-70,77,89-92, 102-104; Kahn, Imperial San Francisco, pp. 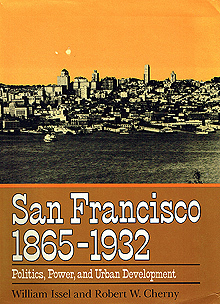 90-91, 100-101 , 159-162; Hansen, San Francisco Almanac, p. 45; Goldbeck, "Political Career of James Rolph;” p. 8; Daniel H. Burnham, Report on a Plan for San Francisco (San Francisco, 1905); Daniel H. Burnham, Plan of Proposed Street Changes in the Burned District (San Francisco, 1906). 15. Rolph's inaugural speech, Jan. 8, 1912, in Chronicle, Jan. 9, 1912, p. 2; Draper, "San Francisco Civic Center," p. 114. 16. Draper, "San Francisco Civic Center," pp. 116- 124. 17. Ibid., pp. 54, 168-169. 18. Todd, Story of the Exposition, 2:242-246, 5:1-6, 100-12 1; Rischin, "Sunny Jim Rolph;” p. 171; Draper, "San Francisco Civic Center;” pp. 121-122, 155-156. 19. Draper, "San Francisco Civic Center;” pp. 205-207, 215-222, 225-228; B. J. S. Cahill, "The New City Hall, San Francisco;” Architect and Engineer 46 (Aug. 1916):39. The opera house site is still vacant, save for a parking lot and a "temporary" building put up during World War II as a hospitality center for soldiers and sailors, currently housing city offices.